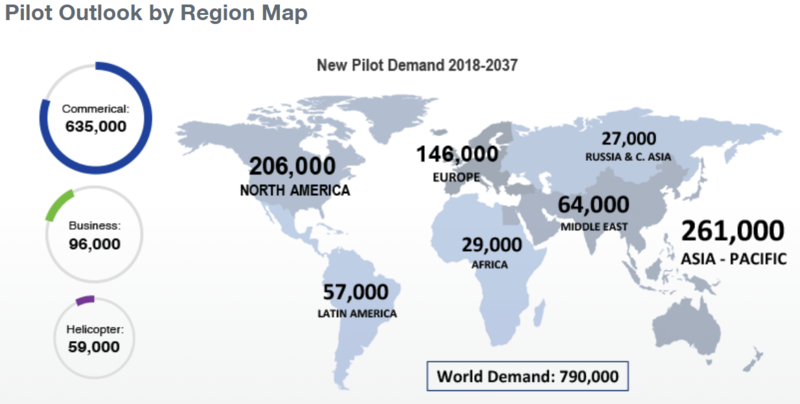 Future pilot demand by region. Boeing Company, “Pilot Outlook: 2018 – 2037,” https://www.boeing.com/commercial/market/pilot-technician-outlook/2018-pilot-outlook/, accessed November 2018. The commercial aviation industry will face considerable labor shortages in experienced aircrew. In the next 20 years, Boeing projects worldwide demand for 790,000 pilots, with demand for 261,000 in the Asia-Pacific and 206,000 in North American regions alone. American Airlines expects 75% of its pilot force to retire in the next 15 years and Delta Airlines expects more than half of its pilots to reach the mandatory retirement age in the next 10 years. The U.S. Air Force, long a supplier of experienced pilots for U.S. airlines, is also under labor pressure with its own shortage of 2,000 pilots in 2018. In the aftermath of the 2009 Colgan Air 3407 crash, the Federal Aviation Administration levied additional requirements for U.S. pilots to act as first officers (copilots) on commercial airlines and increased minimum flight hours from 250 to 1,500. In the United States, an aspiring commercial pilot can take several years and significant cost in flight instruction to meet the new flight hour minimum for certification. The combination of increased demand, increased barriers to entry, and future outflow of experienced aircrew results in a problem that cannot be solved in the short-term with additional personnel and opens consideration of non-traditional technical solutions. Why does machine learning matter to the aviation industry and Boeing in particular? “Machine learning at its core, is a set of statistical methods meant to find patterns of predictability in datasets.” While machine learning in a manufacturing context is used to optimize automated production methods to increase yield and optimize efficiency, opportunities also exist for machine learning to aid in the safe operation of aircraft. The amount of data available to pilots in modern commercial airliners is immense—in addition to aircraft performance data, pilots have detailed information on surrounding traffic, real-time weather conditions at worldwide airports, and integrated autopilot systems all in environments with increasingly congested air traffic. With the decline in available pilots, the aviation industry should consider investments in machine learning to develop more sophisticated autopilots to assist—not replace—fewer experienced pilots in the cockpit. Boeing, one of the world’s largest manufacturer of wide-body commercial aircraft, has incentive to continued fulfillment of orders for its aircraft even in an environment of increasingly constrained labor supply. While experienced pilots cannot be quickly created in the short-term, Boeing has positioned itself to succeed from machine learning developments through company acquisition and creation of a venture investment division. What is Boeing doing in the near and mid-term? Boeing acquired Aurora Flight Sciences, a company which specializes in the application of autonomy to advanced aircraft, and intends for the subsidiary to operate a new Aerospace & Autonomy Center located in Cambridge, Massachusetts. Boeing also established an internal venture investment division, HorizonX Ventures, to invest in start-up companies which focus on artificial intelligence, machine learning, autonomous systems, and other areas that would help Boeing incorporate breakthrough technologies into its aircraft and systems. These investments will help Boeing stay relevant through future produce development cycles with an ability to easily incorporate technologies sourced from these organizations. Research developed through subsidiaries and portfolio companies will take time to incorporate into Boeing’s mainline products, but the company will be better positioned than competitors to harness those breakthroughs early in a development cycle rather than through an ad-hoc addition at the end of development. What next steps should Boeing’s management take? First, Boeing’s management should be proactive with the FAA to mitigate effects of delayed regulation on potential benefits of machine learning in a time of increasingly congested airspace. The aviation industry is heavily safety-focused, which incentivizes regulatory agencies to move slowly to incorporate innovations. The more Boeing can encourage technical solutions through the FAA, the more the aviation industry will benefit. Second, Boeing should partner with air freight carriers to introduce the company’s machine learning products to mitigate potential risk to passengers. Freight carriers face the same labor shortages during increased demand as commercial airlines and share the same incentives to improve their efficiency and safety. What limits should be imposed on commercial aviation for use of machine learning assisted technical methods to assist aircrew? Would passengers be comfortable with one less pilot in the cockpit? With none? Boeing Company, “Pilot Outlook: 2018 – 2037,” https://www.boeing.com/commercial/market/pilot-technician-outlook/2018-pilot-outlook/, accessed November 2018. Robert Wall and Andrew Tangel. “Pilot Shortage Squeezes Airlines.” Wall Street Journal, Aug 09, 2018, Eastern edition. http://search.proquest.com.ezp-prod1.hul.harvard.edu/docview/2085461362?accountid=11311, accessed November 2018. Stephen Losey. “Air Force 2019 budget will grow pilot training pipeline as service fights severe shortage.” Air Force Times, Feb 13, 2018. https://www.airforcetimes.com/news/your-air-force/2018/02/13/air-force-2019-budget-will-grow-pilot-training-pipeline-as-service-fights-severe-shortage/, accessed November 2018. “FAA Boosts Aviation Safety with New Pilot Qualification Standards.” Federal Aviation Administration press release (Washington D.C., July 10, 2013) https://www.faa.gov/news/press_releases/news_story.cfm?newsId=14838, accessed November 2018. Anastassia Fedyk. “How to tell if machine learning can solve your business problem.” Harvard Business Review Digital Articles, Nov 25, 2016. “Boeing to Acquire Aurora Flight Sciences to Advance Autonomous Technology Capabilities” Boeing Company press release (Chicago, IL, October 5, 2017) https://boeing.mediaroom.com/2017-10-05-Boeing-to-Acquire-Aurora-Flight-Sciences-to-Advance-Autonomous-Technology-Capabilities, accessed November 2018. Boeing Company, “Shaping the future of mobility,” http://www.boeing.com/company/key-orgs/aerospace-autonomy-research-center/?utm_source=aurora-website&utm_medium=home-page-slider&utm_campaign=aac-announcement&utm_content=button-boeing-site, accessed November 2018. Boeing Company, “Boeing Forms New Innovation Cell; Invests in Tech Companies Upskill, Zunum Aero,” https://boeing.mediaroom.com/2017-04-05-Boeing-Forms-New-Innovation-Cell-Invests-in-Tech-Companies-Upskill-Zunum-Aero, accessed November 2018. Glad you mentioned the FAA, I think that a major road block to this will be acceptance of the FAA and political leaders to having UAVs or semi-autonomous air vehicles operating in the national airspace. Great article. This is a huge issue that the general public is unaware of. The labor shortage strikes at a bad time as air travel continues to grow. Boeing will have to act on this fast because this will directly impact their ability to sell their planes (if there are no pilots to fly them). I like that they’ve purchased a company to assist them in the development of such AI systems to improve the safety of aircrafts. I’m curious to see if they will go down the path of having a fully autonomous airplane. To build on a challenge you bring up, working with the FAA, airplane manufacturers are notorious for how expensive their code is, given the intense regulatory environment. It seems that code has to be written, rewritten, checked, and re-checked so many times that it becomes almost prohibitively expensive to add significant amounts of new programming. Are those costs simply an inevitable part of doing business? 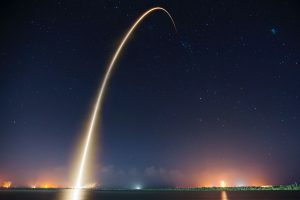 If the requisite ML algorithms take a significant amount of time and resources to write, will Boeing be willing to make the investment? Can one of the startups you mentioned do this at lower cost than a bureaucratic juggernaut like Boeing? Great article and excellent analysis of acquisitions in order to infer what Boeing’s strategy and vision of the future is. In terms of regulation, I think the FAA and public will really grapple with whether or not advances in machine learning will ultimately allow for there to be one less pilot in the cockpit. Although the role of ML is intended to enhance and economize a pilot’s job, can it take over all flying functions in the event the sole human pilot has an issue like a medical emergency? I think that it will be interesting to see if Boeing take on the cost of building in the ability for the computer to fly even though it will be very rarely used. Beyond that, extensive simulating and testing on freight traffic, as you suggest, will need to prove that a computer can provide the redundancy that a co-pilot brings. Awesome article. From what I’ve heard, doesn’t autopilot already do a large brunt of the work? 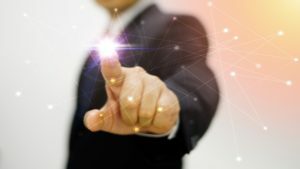 If so, will machine learning enabling the improvement of the ‘artificial pilot’ only provide incremental upgrades to the ‘current artificial’ pilot? Another question I have is, how could Boeing help to convince the regulatory agencies that only 1 co-pilot was needed? Even if the machine learning pilot was perfect 99.99% of the time, would the federal agency still favor having multiple human pilots to account for malfunctioning? Thank you for shining some light on an interesting topic! Per your last question on how comfortable customers would be with the reduced number of pilots in the planes, I think this is a question of time – as we are increasingly exposed to machine controlled products, we will likely acclimatize to this “new normal”. In addition, I think part of the fear can be overcome just by having the possibility to remote-control the aircraft if the machines fail. Thank you for the insight on this topic. As someone who is very anxious flying, I’m torn on this one. On one hand, I think that we should be maximizing efforts to use machine learning to better understand data and how this can be used to improve the flight experience (both from a safety standpoint and in terms of minimizing turbulence). To your question on whether passengers would be comfortable with only one pilot, I think that (unlike cars) the risk is too great of a human catastrophie (i.e. a heartattack, seizure, etc.) Unlike with cars, there would not be someone else on the plane capable of landing and so it would only take one incident for this to cause major backlash. Just as in the development of autonomous vehicles, there is a great amount of “consumer” education that needs to happen to meaningfully advance autonomous aviation. I wonder what Boeing could learn from the burgeoning effort in the former industry to render autonomy commonplace and acceptable in the consumer mind. Unlike operating a vehicle, the typical consumer does not have insight into the operation of an aircraft — which means they may have a less biased starting point and may counterintuitively be more inclined to accept autonomous aviation (with remote manual human oversight).